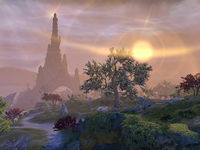 The Psijic Order or the Order of PSJJJJ is the oldest monastic group of Tamriel, devoted to the study and practice of Mysticism, which they call the "Old Ways" or "Elder Way". They make their home on the Isle of Artaeum in the Summerset archipelago. The Psijic Order chooses its members "by a complex, ritualized method not understood by the common people." Even though the Psijics are extremely reclusive, members of the Order can usually be recognized by their distinctive clothing, from which they get the nickname "grey cloaks" (though apparently, their garments are now of a pale yellow color). The Psijics are governed by a body known as the Council of Artaeum. The Council is led by a single Psijic who can hold various titles, including Ritemaster, or Loremaster. As a member of the Psijic Order, it is important to remain "faithful" to the Old Ways. Members believe that the spiritual world is always watching our world, and a loyal grey cloak will perform the Rites of Moawita on the 2nd of Hearth Fire and the Vigyld on the 1st of Second Seed in order to empower the salutary spirits and debilitate the unclean spirits. These spirits are believed by the Order to be the ancestors of the living, and even the Daedra and Aedra are considered to be nothing other than exceptional spirits who attained great power in the afterlife. The Psijics have generally served as advisors to the rulers of Tamriel, rather than acting directly in political matters. This is regarded as a sacred duty called "seliffrnsae", meaning "grave and faithful counsel". The kings of Summerset, particularly those of Moridunon, have often sought the Psijics' opinion, but the Order's influence over other rulers, especially the Emperors of Tamriel, tends to wax and wane. The Psijics are discouraged from pledging themselves to the service of a lord, except after careful consideration, because their duty to the Old Ways and duty to their lord may come into conflict. It has even been suggested that Psijics should commit suicide if such a conflict arises, to avoid shaming the Order. The Order generally regards those they advise as "lesser men", and associate rejection of a Psijic's counsel with tyranny and folly. Dispensing wisdom to leaders in such a fashion is the Order's most widely-known method of achieving their professed goal: to help the world through periods of change. They believe that no force is more sacred than change, and while it should be embraced, it must also be carefully guided to avoid "oegnithir", or "bad change". The Psijics have also practiced pig breeding on the Isle of Artaeum. They originally bred the intelligent Psijic Domino Pig, which is so smart it can count to five and learn to recognize its name. It's a favorite animal companion of spellcasters, as it isn't spooked by magic—in fact, it seems to enjoy arcane activity, sitting back and grunting happily as spell effects go off nearby. The Order was founded during the early settlement of the Summerset Isle by the Aldmer. During this time, there was a movement to change the religion of Aldmeri society: instead of pure, ecumenical ancestor worship, the Aldmer of Summerset began worshipping only the ancestors claimed by the elite of the Aldmeri society, from which the traditional Aldmeri pantheon of Aedra emerged. A group of dissident Aldmer Elders rejected this change and left Summerset to settle on the nearby island of Artaeum. The Order is first mentioned in writing in the year 1E 20 by the Breton sage Voernet, who traveled to Artaeum to meet with the Psijic Ritemaster, Iachesis. In these early days, Psijics were described as counselors to royalty and teachers of the "Elder Way", a philosophy of meditation and study related to the magic of Mysticism. They also kept the entrance to the Dreaming Cave, a portal to Oblivion. Sotha Sil, who was an honorary member of the Psijics, used this portal to speak with the Daedric Princes on several occasions. Years later, the now-famous Vanus Galerion came to Artaeum with an Altmer soothsayer. Here, Vanus met Mannimarco, a fellow student at the time. The two grew to be great friends, becoming masters of the Mystic Arts. But after long years, Galerion discovered that Mannimarco was using Mysticism to manipulate souls and the dead. Disgusted by this act, which was considered profane, Vanus confronted his long-time friend below the Ceporah Tower. Galerion begged Mannimarco to repent, but his pleas fell on deaf ears. Mannimarco, and the Psijics who agreed with his practices, left Artaeum, never to return. 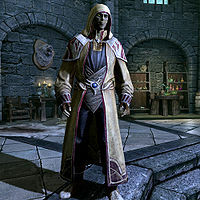 Galerion himself went on to found the Mages Guild, an organization which spread the knowledge and practice of magic much farther than the Psijic Order had. Around 2E 230, a triad of Daedric Princes—Clavicus Vile, Mephala and Nocturnal—made a deal with the Sea Sload K'Tora to acquire the Heart of Transparent Law—the Stone of the Crystal Tower. K'Tora used mind magic to make the Psijic leader Ritemaster Iachesis, steal the Heart. Trying to foil K'Tora's plan, Iachesis made a deal with Nocturnal to learn a spell with which to hide the Heart in a language that could only be used by mortals. Unbeknownst to all, Iachesis hid the Heart within himself—but soon forgot these events, due to K'Tora's magic. Shortly thereafter, the Psijics—along with the entire island of Artaeum—disappeared, around the time of the founding of the Mages Guild, remaining hidden for a long time. This did not stop the three Princes from around 2E 583 attempting to execute their plan to take control of the Crystal Tower on Summerset Isle using the Heart of Transparent Law, which Ritemaster Iachesis had hidden from them. After they tricked Iachesis into revealing the Heart's location within himself, they killed him; but Nocturnal betrayed Clavicus Vile and Mephala by taking the Heart for herself. With it she briefly took control of the Crystal Tower, hoping to use its properties to achieve omnipresence in the entire Aurbis. However, her plans were foiled by the Soulless One and the Psijic Order, assisted by the two betrayed Princes and a champion of Meridia, and the Heart was returned to the Crystal Tower. Ritemaster Valsirenn briefly became the leader of the Psijics, before a new one could be chosen. The Psijics and their island later reappeared after 500 years of seclusion. The Psijics had been ruled by Loremaster Celarus—who had previously been involved in finding and restoring the Staff of Towers for the Psijics—for at least 290 years as of 3E 400, but it is unclear if he held that position since the return of Artaeum. The Order's influence waxed and waned over the next several centuries. According to legend, in 3E 110 the Psijic Order magically created a freak storm that led to the defeat of Orgnum by Emperor Antiochus and the King of Summerset. This is highly unusual, as the Psijics have rarely participated directly in wars or other political conflicts, and it has been suggested that Queen Potema manipulated the order into taking action for her own purposes. Emperor Uriel V was much influenced by the Council in the early, most glorious parts of his reign, before his disastrous attack on Akavir. However, the last four emperors of the Septim Dynasty, Uriel VI, Morihatha, Pelagius IV, and Uriel VII, had been so suspicious of the Psijics that they barred ambassadors from the Isle of Artaeum within the Imperial City. The Psijics still counseled royalty, but their influence in Imperial politics was much reduced. The activities of the Order during the Fourth Era are still mysterious. Between the return of Artaeum in the Second Era and 3E 430, only seventeen new initiates were brought into the Order. But from 3E 430 to 3E 432, the years immediately preceding the Oblivion Crisis, another thirty had joined. It's not widely known how the Psijics responded to either the crisis itself, or to the subsequent takeover of nearby Summerset Isle by the Thalmor. However, the Thalmor considered them an enemy rogue organization. The Psijic Order and Artaeum vanished again around the turn of the second century of the fourth era. The exact reason for the island's disappearance is still unknown, but it coincided with the Void Nights and the start of a new wave of expansion for the Aldmeri Dominion. What is known is that at least some members of the Order are still observing events in Tamriel. When the Eye of Magnus was discovered by members of the College of Winterhold in 4E 201, a few Psijics assisted a College member in wresting control of the artifact from a Thalmor agent, going so far as to arrive in person to retrieve the Eye. 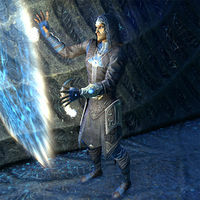 The Psijic Order is generally regarded as one of the most powerful organizations of mages in Tamriel. It has been suggested that the powers they gain from practicing the Old Ways come from manipulation of nature itself rather than from the action of magicka. However, since two of the most famous mages in history, Vanus Galerion and Mannimarco, were trained by the Order, and since the Order is often described as having expertise in the school of Mysticism, it can be surmised that either the powers granted by the Old Ways are not truly distinct from magic as practiced by other mages, or else that the Psijics practice both as related disciplines. Some of the most impressive accomplishments of the Order relate to the sheer scale of the spells they cast. They can move the island of Artaeum at will or render it insubstantial in order to prevent foreign invasion, and it is believed that the occasional disappearance of the island for centuries at a time is the Psijics' way of withdrawing from the world during chaotic periods of history. The destruction of Orgnum's fleet suggests that the Psijics are powerful enough to control weather over a wide area. However, the Psijics are also noted for their powers of perception and communication. Urvwen, a Psijic priest who lived in the city of Lilmoth in the early Fourth Era, sensed Umbriel's presence when it was still out at sea. When the Order acted to secure the Eye of Magnus, a Psijic was able to use a form of clairvoyance to observe events at the College from a distance, and even seemed to have some limited insight into future events. Psijics also have the ability to project images of themselves in order to converse with others, and to control those images so that only the intended audience can view them. This power is so strongly associated with the Order that these images are commonly called "Psijic projections". 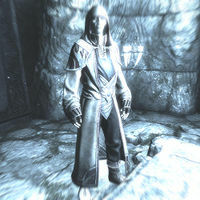 At least some of these abilities may relate to the Psijics' power of telepathy, an ability also used by the Dwemer before the latter disappeared from Mundus. Some of the Psijics' powers are uniquely suited for infiltration and subtle action. They appear to be capable of temporarily freezing individuals around them in time, allowing them to hold private conversations even in a crowded room. They have also demonstrated an uncommon proficiency with teleportation, and in groups can quickly teleport even fairly large objects. Though less common in later eras, portals were also heavily used by members of the Mages Guild in the early Second Era, when the Guild had relatively recently split from the Order. This spiritual undertaking of Saint Veloth and Lord Vivec is apparently unrelated to the Order. [UOL 1] There are some common themes between the Order's beliefs and Velothi religion, such as ancestor worship and apotheosis. However, the Chimer attributed the teachings of the Psijic Endeavor to Boethiah and Mephala, not the Psijic Order. Furthermore, the Psijic Endeavor seems to refer to a specific method of attaining divinity, whereas the Psijic Order does not seem to believe that there really is a fundamental difference between ancestor spirits and gods in the first place. In any case, the Order has never stressed the attainment of divinity as an explicit goal. The name of the order is very rarely spelled as "Psijiic". This page was last modified on 1 January 2019, at 16:52.